Red kites have been regularly seen in recent years on the main Cotswold scarp from Broadway down towards Winchcombe, and are believed to be nesting above Broadway. 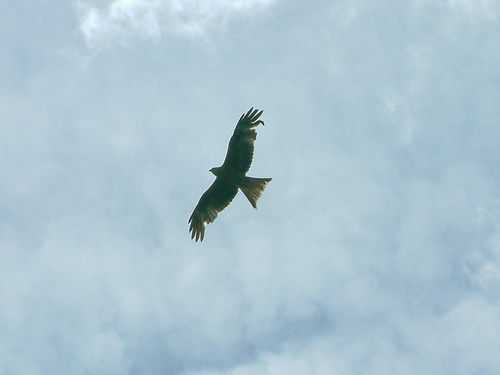 One-off sitings of Red Kites have been reported over Bredon Hill for many years, particularly in the last 10-15 years. It seems these sitings over Bredon were of birds ‘passing through’ (or over) as there were no regular sitings. Things changed in May 2013 when two birds were seen repeatedly above Elmley Castle on the northern slopes of the hill circling over the edge of woodland and over adjacent grass fields. These birds remained there for several weeks, but from late June only one was seen regularly and in late July and through August there were only irregular sitings. In the third week of September two birds re-appeared at the same site, with an unconfirmed report in the last week of September that three birds were present. All of the early reports were from a reliable nature-loving land-owner who periodically had been leaving rabbit and pheasant carcasses out for the birds, but plenty of other Elmley Castle and Comberton residents saw the birds too. 20 September 2013 – single bird over Ashton-under-Hill. Hopefully this means that perhaps they bred here this year, and that the skies over Bredon Hill will be graced more regularly by these magnificent birds.